“How can one man have so much power? We were told there will be a vote, but apparently, the SEC commissioners didn’t think this decision was important, delegating it to Aleman. Then, what’s the point of the commissioners?… Delegating this decision to a faceless bureaucrat is an insult. For them to hide behind an Assistant Secretary, not even a Secretary, is an intentional slap. Aleman’s reasons for rejecting the ETF was because he wanted a surveillance sharing agreement between exchanges and because he said much of the trading was carried out in unregulated Chinese bitcoin exchanges. The latter part was out of date even at the time of the decision. PBoC has moved in, laying out some red lines for Chinese exchanges. Aleman further said Gemini lacks liquidity, but that’s mainly because traders naturally go to exchanges with futures and margins, two necessary facilities that CFTC continues to deny to regulated American exchanges such as Gemini and Coinbase. It is surprising, however, that the decision is now to be reviewed. Even more so because the person who rejected the ETF, Aleman, has approved the review of his own decision. It is still too early to say how this review will be carried out, but one thing I hope we can say for sure is that Aleman will have no further part in any of it. That’s for obvious reasons which do not even need to be stated. One can’t review their own decision in an institutional context. It’s like carrying a judicial appeal in front of the same judge who clearly has already reached a decision against you. 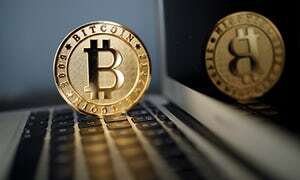 Germany's top finance regulator has moved to shut down a payment processor tied to the OneCoin cryptocurrency scheme, a digital currency service that has faced widespread allegations of fraud. The Federal Financial Supervisory Authority (BaFin) said on 10th April that it was freezing the accounts of IMS International Marketing Services GmbH, which is registered in Germany. According to BaFin, the firm accepted €360m on behalf of OneCoin between December 2015 and December 2016. Of that amount, €29m is being held in the accounts frozen by the regulator. "In case IMS should not abide by the order to cease business, BaFin threatened to impose a coercive fine of €1.5m; for non-compliance with the winding-down order, it would impose a coercive fine of €150,000. By law, the administrative acts, including the threats of coercive fines, are immediately enforceable." With the move, BaFin becomes the latest regulator in Europe to take action against elements of the OneCoin scheme. OneCoin is a multi-level marketing scheme that pitches an eponymous digital currency as an investment opportunity. Prospective buyers purchase batches of tokens which can then be redeemed online, though those involved are strongly encouraged to find buyers of their own – a characteristic that lends itself to accusations that OneCoin is a pyramid scheme. In the past year, regulators in several African countries have warned consumers about local efforts by OneCoin to solicit investors. In the UK, London police have been investigating OneCoin since as early as September, while in Italy, regulators moved last month to prohibit promotional efforts for OneCoin by local proponents. Notably, BaFin made it clear in a statement that it was moving against the firm due to unlicensed money activities rather than the legality of sales of OneCoin tokens. "BaFin does not have the right to decide as to the validity under the civil law of the 'OneCoins' sales contracts. 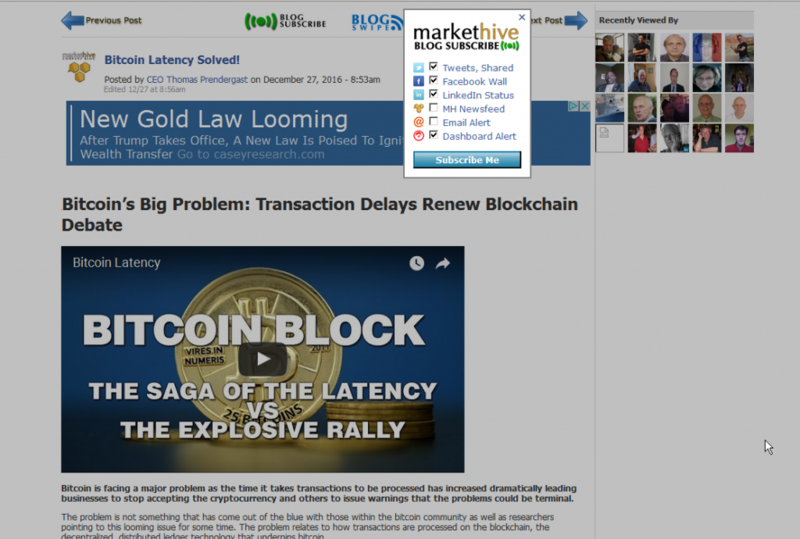 It may therefore not answer questions of this nature," the agency said. "I feel like I'm doing everything right, but I'm not seeing results." Do any of these statements sound familiar? A lot of marketers and CEOs we talk to feel like they are doing all the right things. But, they aren't achieving their goals. A recent survey from DM (Direct Marketing) News confirms this is common. 46% of the executives surveyed, stated that a "lack of an effective strategy" was the biggest obstacle in achieving their inbound marketing goals. So why is everyone struggling? I'm not quite sure as to WHY, but in this blog, I'll show you HOW you can overcome this obstacle…and overcome it in the next 24 hours. Let's roll! First, let's identify what strategy actually is. It really doesn't have to be that complicated. Strategy is simply a plan of action designed to achieve an expected goal. So, we need a goal to get started. For the purpose of this article, let's say that our goal is to generate 50 qualified leads per month for my sales goal. If we're going to generate 50 qualified leads per month for your sales quota, we need to define a "quality lead". Let's pretend we're a coffee distributor that provides energizing weight loss coffee for coffee drinkers, dieters, fitness, etc. If we can get a “Sample” Request, a pre enrolled lead, we consider that a quality lead. Nail down your target market. Target Market Example: Diet sites located in the United States, health clubs that are doing between $500,000 and $20M in revenue annually. Talk to the sales team and establish what a quality lead is. In this case, we know we need 50 Sample Requests and Pre Enrollments each month. Honestly, this should be something you already know (your target market).But give yourself an hour to talk to a few people inside your sphere, friend networks and groups, read through your messaging, and establish who you're really after. Give yourself another hour to talk to a few reps or the sales people in your network. Or potentially, set up a conference and invite others in your network that is similar in their business to yours. Once we know who our audience is and what our goal is, we need to locate our audience. Where are they online? You'll want to look at social media, blogs, websites, and forums. Make a big list! Here's what I might do if I were looking for vertical markets. First, I'd dive into social media. I know LinkedIn is better for B2B, so I head there first. There are tons of various groups, so I started looking for groups full of my audience. 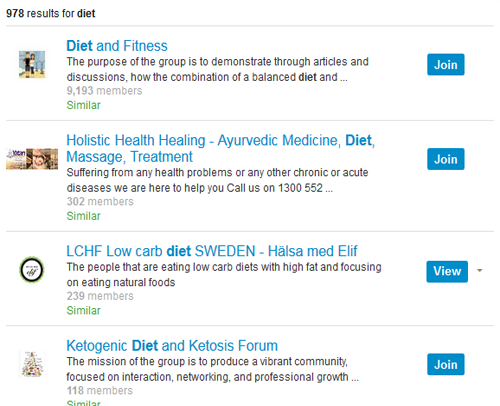 A quick search for "dieters" brings up 978 different groups. I will continue my search for "fitness", " coffee drinkers ", and "weight loss". After spending some time gathering a list, hopefully I've identified at least 500 solid groups that have my target audience. Next, I'll explore other social media options to see if there is anything market specific. 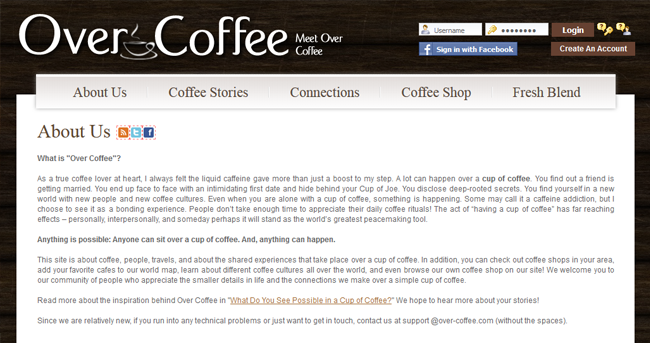 After spending some time on Google, I run across Over Coffee, a social network for coffee drinkers, marketers and socializers. Still further, I'll spend some time on Google again looking for blogs, forums and other websites where I might find my audience. 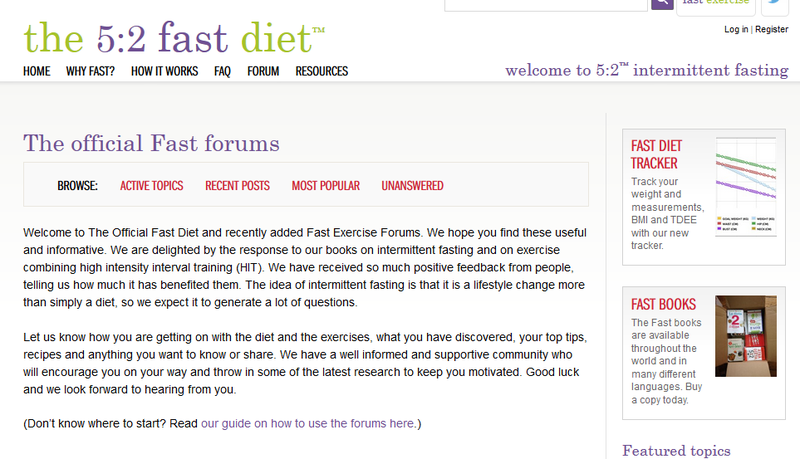 As an example, it is a pretty sure assumption the Fast Diet forum fits. Another excellent tip is searching for the topics in Discuss. Since Discuss has no search abilities, Google comes in handy. But you have to know the tricks to search. I made a little video here to explain how quickly. At the end of this research process, you should easily have 500-1000 websites (forums, blogs and other websites), groups (on LinkedIn, Twitter and Facebook) and communities (on Google+) on your list. Now, we're getting somewhere! We're narrowing down the Web and locating the corners in which we want to spend our time and effort. Create a master list with links to these places. Utilizing Markethive’s Backlink System, you can track backlinks, store login data, and manage campaigns easily. 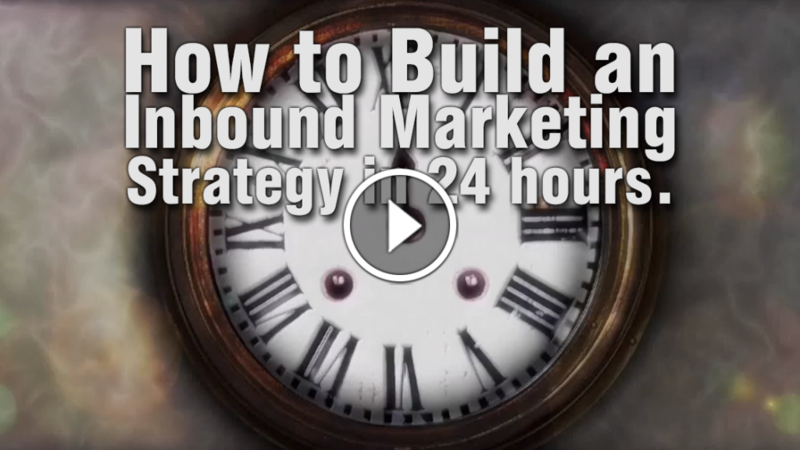 Don't shortchange yourself here.Put in the time to locate your audience.This step will serve you well for many inbound campaigns into the future, so spend about four hours doing your research. Create the list in your MH backlinks as you go along. What you want to do is listen to the problems that your audience is expressing. You want to write down the questions they are asking. Write down the things they are complaining about. You want to be able to speak their language. You'll start to see different discussion questions, comments on blogs, or frustrations. Here are a few sample discussion topics I pulled from a LinkedIn Group full of dieters. There are articles that walk through this step in much more detail, so I'm not going to do that. This will be a high level overview. Basically, now that we've got a sense for what our audience is dealing with, we can brainstorm some effective blog titles, maybe some webinar topics and definitely some e-book ideas. If we think back to our goal of 50 qualified leads per month, you might be asking, "How many blog articles should I be writing?" or "How many capture pages, do I need?" Based on my experience, without knowing how much traffic this hypothetical website is getting or how many leads it's currently generating, you'll want to be creating 2-3 blog posts per week. 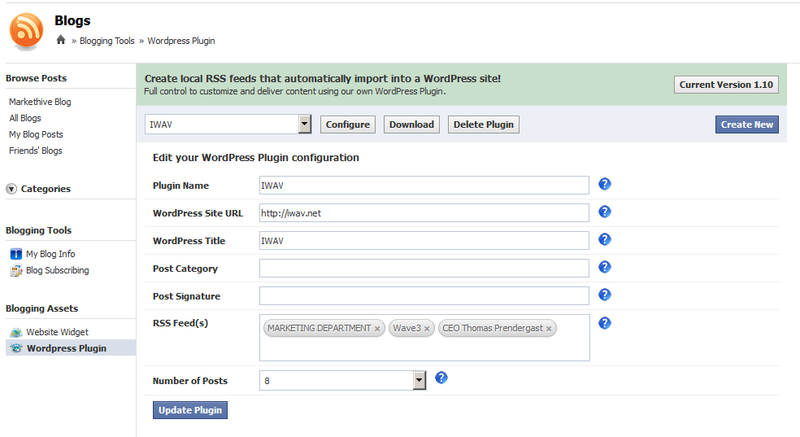 With your blog posts WordPress plugin, your Markethive blog system becomes a BlogCasting system. 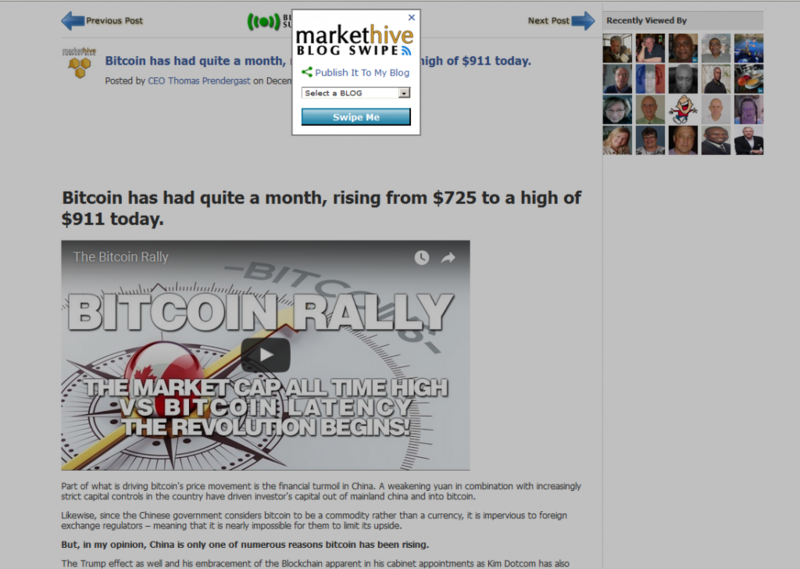 The subscribing potential your blogs will have with other Markethive social members. Case in point the Proprietary subscribe system. The Markethive Blogcasting Word Press plugin allows your blog articles massive syndication to other Markethive members Word Press blogs. 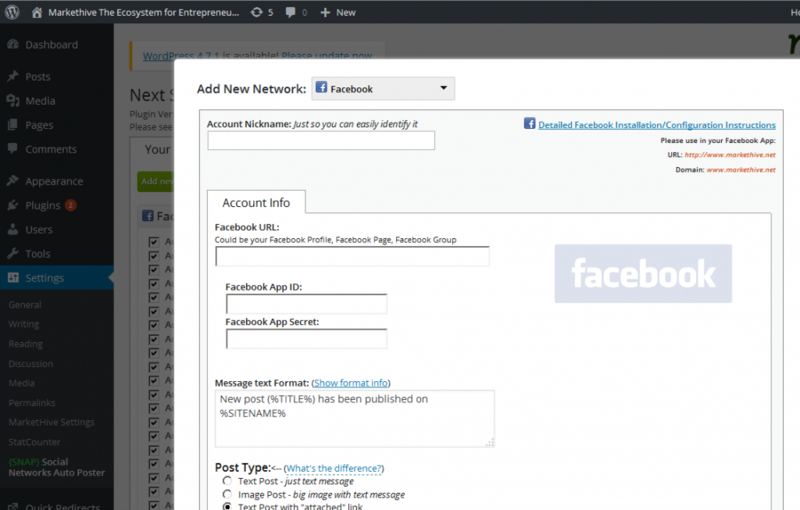 The SNAP plugin for Word Press then allows greater broadcasting to over 25 social networks and literally millions of LinkedIn, Facebook, Google+ groups and Twitter hash tagged directories. The potential of just the “SNAP | Word Press | Markethive Broadcast” plugins can literally build reaches into the billions. We know because we have achieved this. You also have Markethive to offer. It is a million dollar platform, offering a monthly service others charge $1000s for, with free membership. But if you are in a vertical market, like diets or coffee, you might want to offer ebooks, live webinars, samples, etc. In addition to the e-books, you'll want to integrate the Markethive nurturing program that moves leads down the funnel towards the level of being joined to you as an Alpha Entrepreneur. Markethive’s lead nurturing system is a quantum leap from other so called lead nurturing when in reality they are nothing more than disguised email espionage. Don’t know how to produce an ebook? No problem, I wrote a blog on how and why just for you. 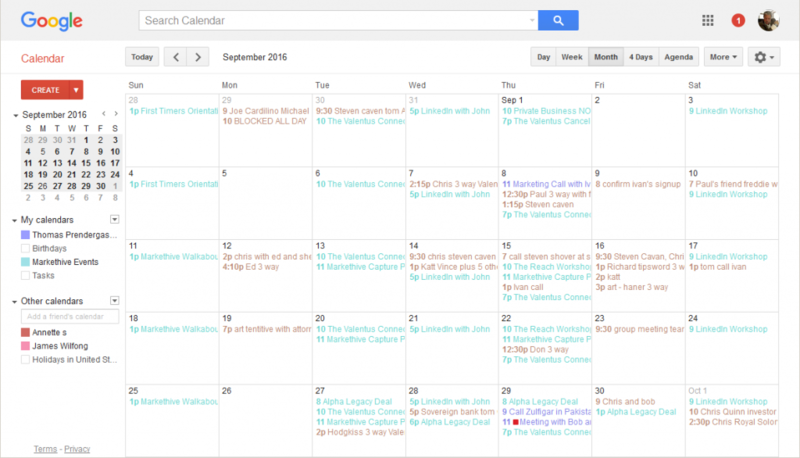 Markethive uses Google’s calendar. It is available on all platforms, Droid, iPhone, Tablets, Laptops and Desktops. It integrates with other Google calendar accounts; it allows events, notes, hidden appointments and reminders, to do lists, and sharing with others who have set up a calendar. Like Markethive’s calendar. Your promotions plan is just as important, if not more important that your content plan and calendar. Most marketers feel like once they hit "publish", it's time to start working on the next piece. Not true! Once you hit publish, it's time to go to work promoting that article. You spent time writing it, editing it, finding an amazing photo and placing a relevant call to action. Now, it's time to zero in on our audience and share that content with them. This is how we'll drive people back to your content, they'll click on your e-books, receive your emails and ultimately sign up for that demo, service or product! You'll be able to comment on other websites and blogs and reference your content in a super relevant fashion because you know exactly what your audience’s challenges and pains are. You'll be able to craft blog titles that are irresistible to your audience because you studied their problems and pains. Create a discussion in all 20 LinkedIn Groups and frame it with the question "What is your biggest weight lose challenge right now?" 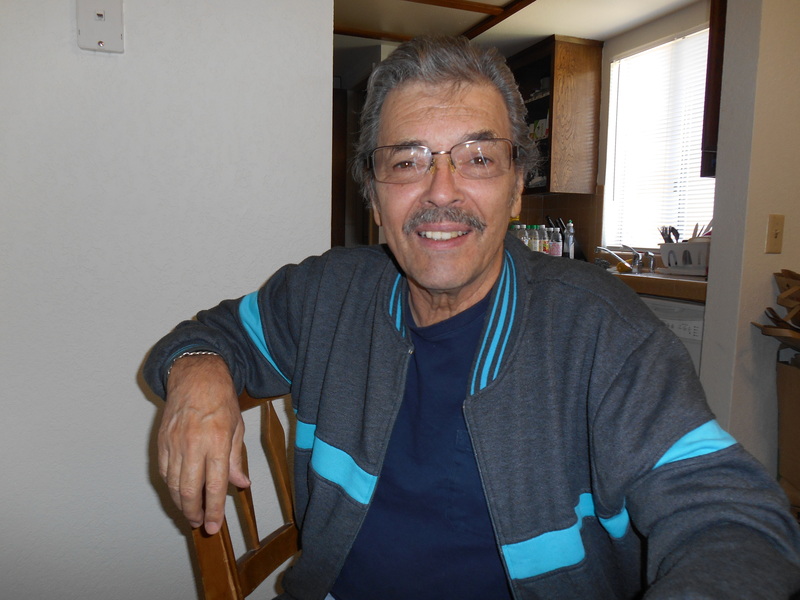 Jump into a couple of forums and find the discussions around coffee and diet. Add value to the discussion and add a link to the blog post as a reference point. 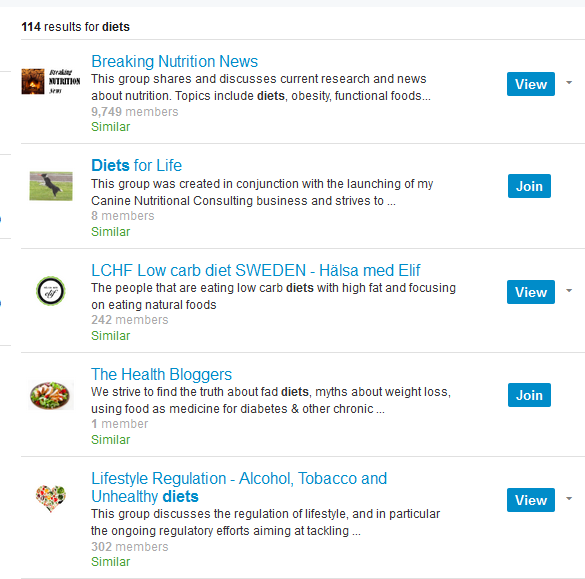 Find individual dieters on Facebook Groups or other websites and send a personal email with a link to the article. Phew! There's a lot of work there, but you can do it… and you can do it in less than 24 hours! The total time spent in this process totals 11 hours. Obviously, it would be a long work day to push through these activities, but you'll be setting yourself up for success over the next several months, if not years. If you can't block off an entire day to do this, spend a couple hours each day for a week and you'll be all set. I'm curious… how much time do you spend on research before diving into content creation? European regulators should embrace cryptocurrencies like bitcoin, the prime minister of Malta argued in a speech yesterday. Speaking at the CEPS Ideas Lab in Brussels on 23rd February, Prime Minister Joseph Muscat argued that governments in the European Union should "double down" on the tech, which he pointed out is slowly catching on amongst the bloc’s financial institutions, according to a transcript published by Live News Malta. Muscat's remarks were in the context of reinvigorating the EU, which has faced rising socio-economic pressures in recent years. He also proposed that leaders in the bloc create financial mechanisms to invest in areas that may be inclined to leave the EU, as was with the case of the UK's so-called "Brexit" vote last year. Though prefacing his statements by saying that he is opting to advocate for "outright insane" sounding ideas, Muscat argued that "the rise of cryptocurrencies can be slowed but cannot be stopped". "My point is that rather than resist, European regulators should innovate and create mechanisms in which to regulate cryptocurrencies, in order to harness their potential and better protect consumers, while making Europe the natural home of innovators." Among the firms in Europe testing the tech is Malta’s primary stock exchange, which in December formed an internal "Blockchain Committee" dedicated to exploring how the exchange might utilize the tech. The exchange further indicated its intention to set up a domestic blockchain consortium in Malta, aimed at creating a basis for the development of new applications.